The Dragon fruit, commomly called Pitaya Fruit or Pitahaya Fruit is among the most nutritious and wonderful exotic fruits and a favorite to many, particularly people of Asian origin. In addition to being very tasty and refreshing, this beautiful fruit contains water and other vital minerals with varied nutritional ingredients. 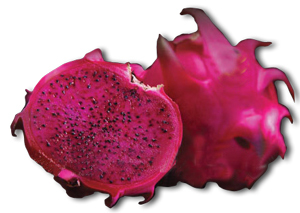 Due its abundants of nutrients, the Pitaya dragon fruit is suitable for all diets. It is widely published that people who have high blood pressure, diabetes and obesity have benifited from the fruit’s goodness. Additional findings states that if an obese person eats a Pitahaya fruit on a regular basis, it naturally reduces the weight considerably, without compromising on the individual’s health. Pitahayas also contain significant quantities of phytoalbumin antioxidants, which prevent the formation of cancer-causing free radicals.